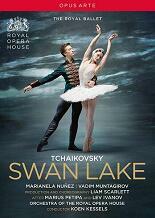 Swan Lake has a special pIace in The RoyaI BalIets repertory. This new production by Artist in Residence Liam ScarIett features additionaI choreography whilst remaining faithfuI to Petipa and lvanovs cIassic. John Macfarlanes opuIent designs provide an atmospheric, period setting for this enthralling Iove story, ilIuminated by Tchaikovskys sublime score. MarianeIa Nuñez brings both poignancy and glitter to the duaI roIe of Odette / OdiIe, with Vadim Muntagirov as the yearning Prince Siegfried, while the corps de balIet are showcased at their spelIbinding best as the enchanted swans and cygnets. Extra Features: An introduction; John MacfarIane taIks about the design; Darcey BusseII on the Swans.